I think the dipping sauce would be great with mozzarella sticks, arancini or fried ravioli. I’m looking at the bread topping to be used on slices of rustic homemade bread instead of a garlic bread-type topping. Make the Dough: Place the dry milk powder, sugar, yeast and salt in the bowl of a stand mixer fitted with the dough hook. Add the water and stir to mix well. Allow to sit until the mixture starts to bubble, about 2 to 5 minutes. Add the olive oil and stir again. On low speed, gradually add the flour until a dough begins to form. Increase the speed to medium-low and knead until a soft, slightly tacky dough forms and it clears the sides of the bowl, about 5 minutes. Turn the dough out onto a lightly floured surface and divide in two. Coat the bottoms of two 9×13-inch pans with 4 tablespoons each of the melted butter. Roll each piece of dough into a 9×13-inch rectangle and fit in the bottom of each pan. Brush the tops of the dough with 1 tablespoon melted butter each. Wrap tightly in plastic wrap and place in a warm, draft-free area until puffed and nearly doubled in size, about 90 minutes. Make the Dipping Sauce: While the dough is rising, prepare the dipping sauce. In a small saucepan, stir together the tomato sauce, sugar, oregano, basil, marjoram, garlic powder and salt. Place over medium heat until the sauce begins to boil, then reduce to low and simmer for 30 minutes, stirring occasionally. Remove from heat. Bake the Breadsticks: Preheat the oven to 475 degrees F.
Once the dough has risen, remove the plastic wrap and score each pan of dough into 10 equal breadsticks (I used a pizza cutter). Bake until golden brown and the edges begin to look crisp, 10 to 15 minutes. For the Breadstick Seasoning: While the breadsticks are in the oven, prepare the breadstick seasoning. In a small bowl, stir together the Parmesan cheese, onion powder, oregano, garlic powder, basil and salt. As soon as the breadsticks come out of the oven, brush each pan with the remaining 1 tablespoon each melted butter, then immediately sprinkle with the breadstick seasoning. 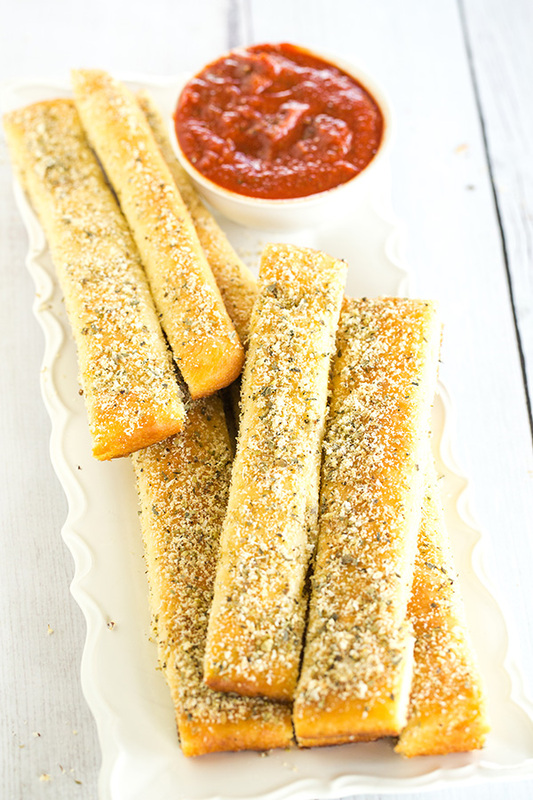 Allow to cool for 5 to 10 minutes in the pan, then use a spatula to slide the breadsticks out onto a cutting board. Slice the breadsticks with a pizza cutter or knife and serve warm or at room temperature with the dipping sauce. Note: You can also mix and knead this dough by hand – just knead until a smooth, slightly tacky ball forms.